Considering each block weighed more than 100 lbs, this was a needed time (and back!) saver! Everybody is happy that we have it here. It’s is an amazing machine, making everybody’s job easier – units are going in faster, everyone is going home at the end of the day feeling a lot less tired. I can’t say enough good things about the mule. Thank you guys! Our field guys at Ford VPEC with Stenco Construction are LOVING the two MULEs on the project! Increased production with less fatigue - we all win! I see SAM as a means to give an owner more detail in the brick veneer wall by adding a design, a company logo, corbelling, or a detailed color pattern using different colors of brick all without slowing production rates due to SAM's efficiencies with these types of details. 30 years in the industry and I have never seen anything with as much potential to change our industry as these MULEs. Want to use SAM or MULE on your next project? 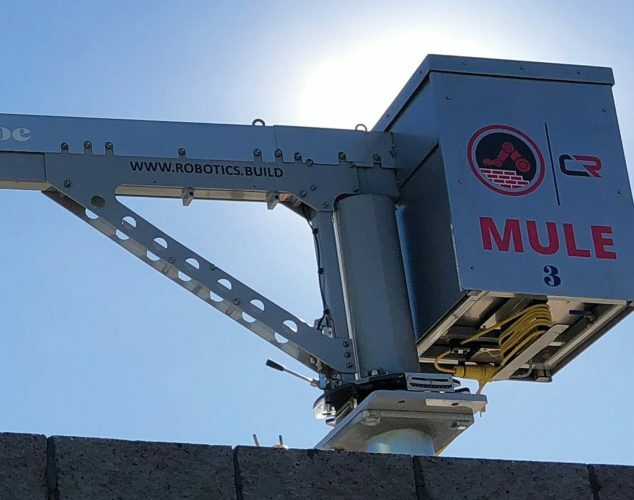 Contact Construction Robotics to learn more. Construction Robotics is dedicated to developing affordable, leading-edge robotics and automation equipment for the construction industry. Copyright © 2007-2019 Construction Robotics. All Rights Reserved.